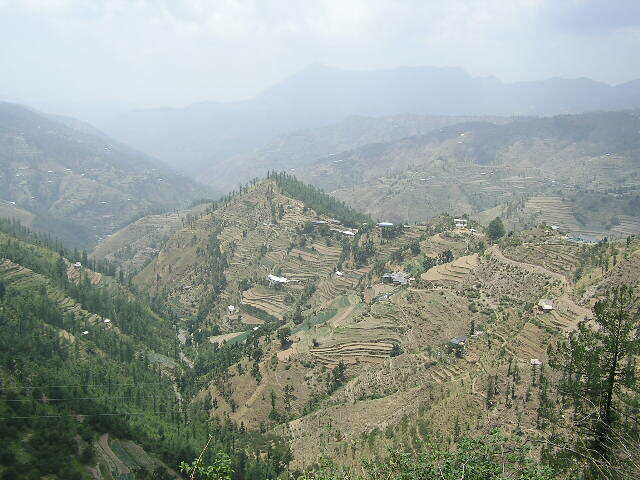 Left for Shimla, the former summer capital of the Raj. Hit it at festival time so it was packed with middle class Indians....everywhere. It was better when the British were here as they didn't allow the Indians in the main streets....how things have changed! Anyway....quickly left again to headed towards the mountains and the relative peace. It was my first day cycling and I was feeling a little weak after getting the shits. All was soon forgot as I headed through the streets on my heavily laden bike. The Indians were just amazing. It was just like riding "Le Tour De France". They all got excited and shouted well wishes as I passed through the villages. Sometimes it seemed like all I could here was "si-keel....si-keel" as they shouted to their friends that a tourist was passing through. I think I spent all day waving. Fortunately I'd spent the past few years strenghening my right arm for this very situation! My first day of peddling was great. Peddling along a 65km ridge admiring the forests and the farms. Views around Shimla on the first days cycling. 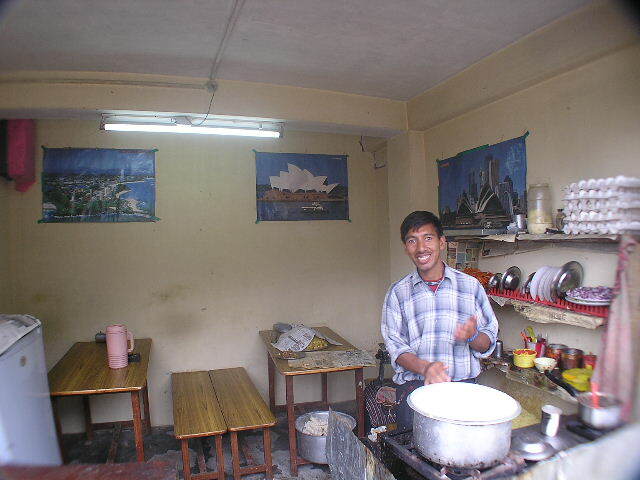 Slept at Narkanda (2708m), a small truckstop town. Next norning woke upto a 35km descent dropping nearly 2000m....truly amazing. No need to peddle at all. Entered the Satluj valley which I'd be staying with for the next few days. The views stunning all the way. Travelling against the flow of the Satluj River so slowly climbing all the time. Stayed in a Rampur, a busy town in a spectacular location beneath the steep valley sides. A good hotel with a balcony and great river views. Set off again up the Satluj Valley. The road cut into the hillside. I was loving every minute of it. Then suddenly in the distance the snow covered Sirikand mountains cheekily peaked over the distant hills. It was an amazing feeling. This is what I came for, the mountains and I could already see them. A huuuuge smile crossed my face and only got biger as the mountains steadily grew nearer. 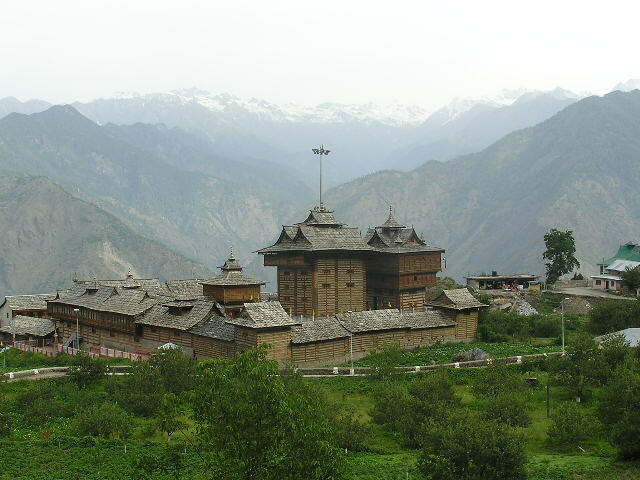 A right turn took me upto Sarahan (2700m) and the Bima Kali temple. An pretty good Hindu temple with an wonderous mountain backdrop. The climb was hard (600m in 16km) and no food was to be found. Again the locals were a treat all the way up the climb. At one point 2 school children gave me a much needed push up the hill. They waved goodbye and I turned to check that my Lonely Planet guide hadn't been swiped of my rear rack. How bad did I feel when I noticed that they had actually wedged an apple in my belongings for me. It things like this that make travelling worth while! Eventually stopped at the first chai stop and collapsed in a chair. Several chais were consumed and then I noticed the pictures on the wall....all of Australia. Rather freaky indeed. 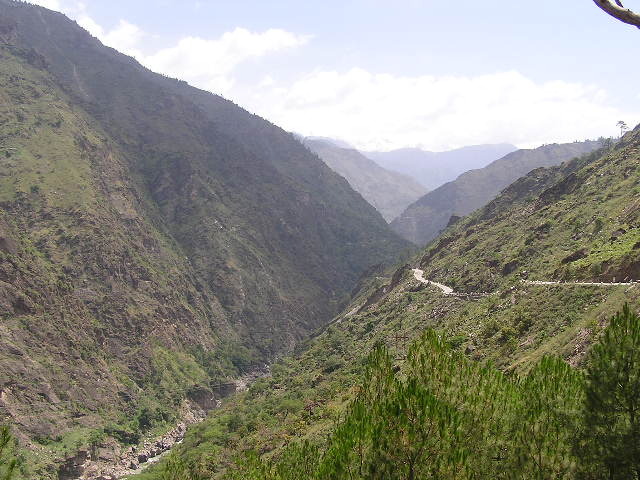 Headed next to the Sangla valley. The journey rather boring passing through dirty migrant villages. Again a painful climb and another good experience as a truck pulled along side and the driver passed me a banana to help with my efforts. Although the climbs are hard I find it rather amusing as the local pass me in their well overcrowded jeeps. They have their family, their extended family and the next door neighbours as well for luck, their faces seemingly squashed against the rear window. They smile, laugh and wave at me as they pass me by. I return the gestures and can't help but feel that maybe it's me who should be feeding them bananas! 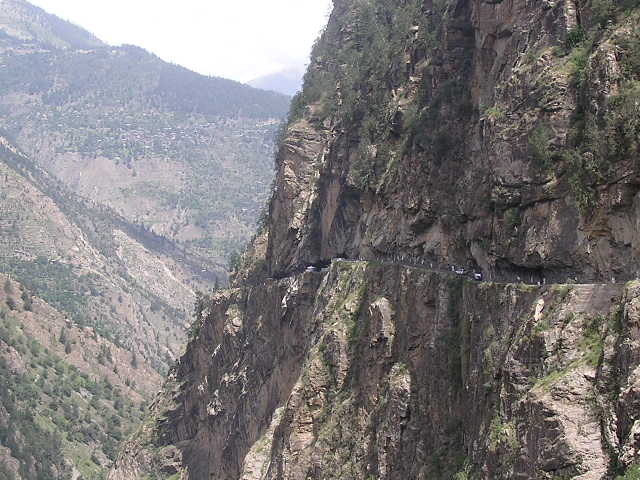 The road up the Sangla Valley. As scary as they get! The Sangla valley was stunning, terminating at Chitkul (3640m). Overshadowed by the 6050m Kinnaur Kailash and the Tibtan mountains. I'm now in Kalpa, waiting for an Inner Line Permit that will allow me to cycle into the remote Spiti region bordering Tibet. It's a relaxed town in the mountains about 2900m. 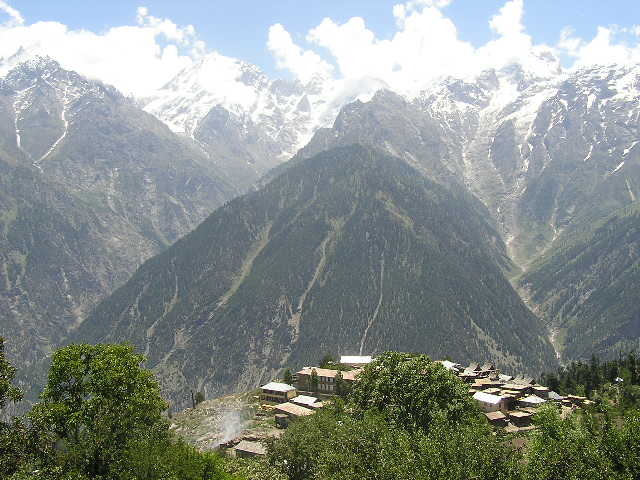 The views of the Kinnaur Kailash are awesome.